Pacquiao-Marquez II: is business really finished? | Sugoi Stuff Pacquiao-Marquez II: is business really finished? Home » Current Events » Pacquiao-Marquez II: is business really finished? Pacquiao-Marquez II: is business really finished? If we recall, Manny “Pacman” Pacquiao and Juan Manuel “Dinamita” Marquez had once met each other in the boxing ring four years ago in Las Vegas, Nevada; it was for the WBA and IBF World Featherweight titles. The match ended in a controversial draw due to the error in scoring committed by one of the judges. Now, the two modern-day gladiators met again to settle their Unfinished Business, thus the name of the pay-per-view that featured the main event card. 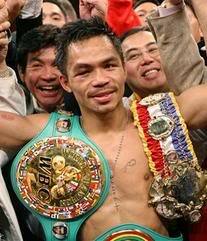 The outcome seemed like it was going to be another draw, until Michael Buffer read the result and declared the winner by split decision, the new WBC and The Ring World Super Featherweight Champion, Manny Pacquiao. The decision was somewhat questionable in my opinion, because I didn’t see Manny take control in most of the bout except for the third round, where he put down Marquez one time. I believed it was one-sided for Marquez, but I don’t know the scoring mechanics, so what the heck. Anyway, the already raucous crowd went wilder as Pacman celebrated with his third world title. Notable people who celebrated beside him are Vice President Noli de Castro and Gov. Chavit Singson, who I believe is his “ninong”. However, the question remains. Is the business between Pacman and Marquez really over? I mean, the standing remains at 1-0 after two bouts. We definitely must see a Pacquiao-Marquez III, because to me, it still isn’t. It can go on as one of the greatest rivalries in boxing history, though not greater than Ali-Frazier. This news isn’t technically SUGOI, but it is for most Filipinos, so I think it can also fit here.